Do you have a pair of jeans that you have loved before but not anymore? And you still can not let it go. I have a simple remedy for that. Old jeans will fade out in time. Dyeing is the answer. This will save it from potential handing it down to whoever. I have a favourite pair of jeans that I purchased circa 2009 that I still want to stay in my closet. My friends even tease me that they want to have my jeans but I just shrug it off. Haha. This is the perfect time to salvage it by dyeing it dark. Wear protective gears like gloves and apron to prevent it from staining your clothes. Using boiled water, dissolve the dye powder in a small stainless container. In my case, I used the powdered form but there are liquid dyes available of course. You will need to add a lot of dyes here to achieve a darker shade. Here I used 6 packets of blue dye. Pour in water into the stainless basin that can cover up the entire fabric and boil it. While waiting for the water to boil, wash the fabric to remove any finishes that may prevent absorption of the dye. When the water boils, pour the dissolved dye. You need to put on 2 tbsp. of salt for every gallon of water you put in the dye bath. Then, put the article into the dye bath. 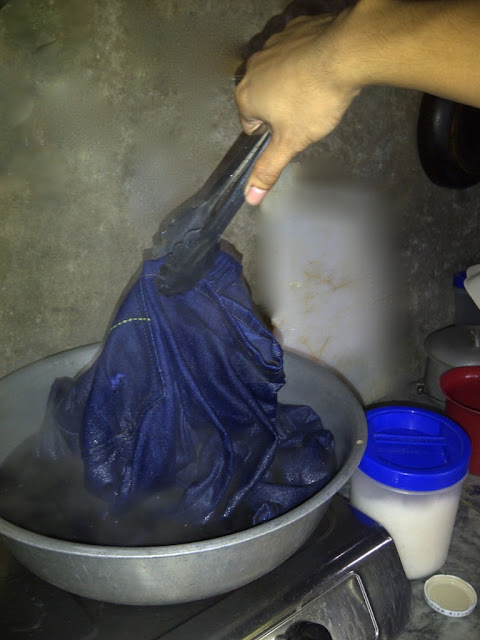 It is important that the jean is fully submerged in water to allow equal shades of dyeing. Continuously stir the garment for 15 to 20 minutes using a ladle or a tong. 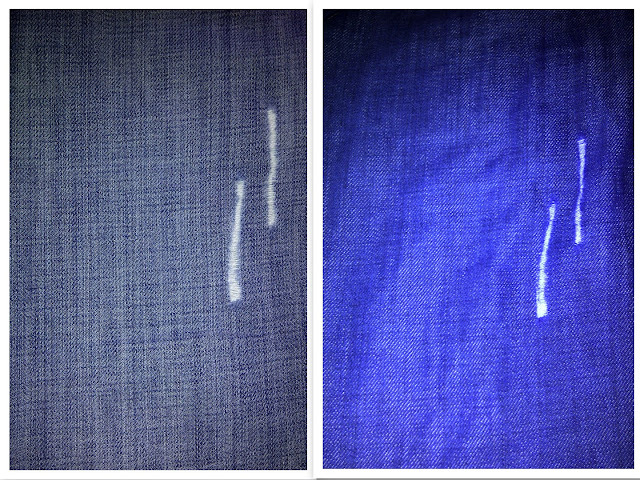 Take out the fabric from dye bath using a tong because the jeans is now smoking hot. You don’t want to burn your hands. Squeeze out excess dye. Run it through the water until the water runs clear. Wring out the fabric for excess water and iron it until dry. And your good to go! I love love the result! Try this and have fun. Don’t forget to drop some comments!